Home service robots are a part of nearly every vision of the future that doesn’t involve our planet ending a smouldering wreck. But versions thus far have either been completely unhelpful, or terrible at standing up. The Robit is meant to be a simple, affordable solution to this problem. The in-crowdfunsinf $329 (around £227) robot is essentially a Raspberry Pi on wheels, with a few extra sensors attached, and a cute head stuck on top. It also connects to Wi-Fi, so you can program and control it from anywhere as long as you have an Internet connection. Out of the box, Robit has a relatively limited skill set. You can drive it around using the on-board camera to see where you’re going and a smartphone app to send driving commands. You can also tell it to guard a door, or watch for movement inside your house. There are party tricks like dancing the Macarena, but in reality, none of the most exciting software ships out of the box. The real magic comes from the open-source code. Similar to the Raspberry Pi, Robit is meant to be a cheap home robot for everyone to tinker with. Doing so is ridiculously easy—you can do things like writing simple scripts to execute movement in a web browser or creating full apps to recognise people’s faces. There are really two markets for Robit: DIY enthusiasts and education. Robit is a capable piece of hardware with a quad-core computer, decent battery life, and the same sensors as most smartphones, which makes it a prime candidate for makers and obsessive tinkerers. Another obvious application is in education. A programmable robot would make primary-schoolers way more interested in coding, and Robit comes with a software simulator, which means an entire class could write scripts, test them on a virtual robot, and finally get their turn with the real thing. The usual caveats apply with crowdfunding: Robit is an unproven company with no track record of delivering things, and crowdfunding campaigns have a bad habit of shipping late, provided they don’t declare bankruptcy along the way. A few things are in Robit’s favour, though: it has a fully-functional hardware prototype that was quite at home in my own apartment, and the hardware itself isn’t outlandishly complicated. 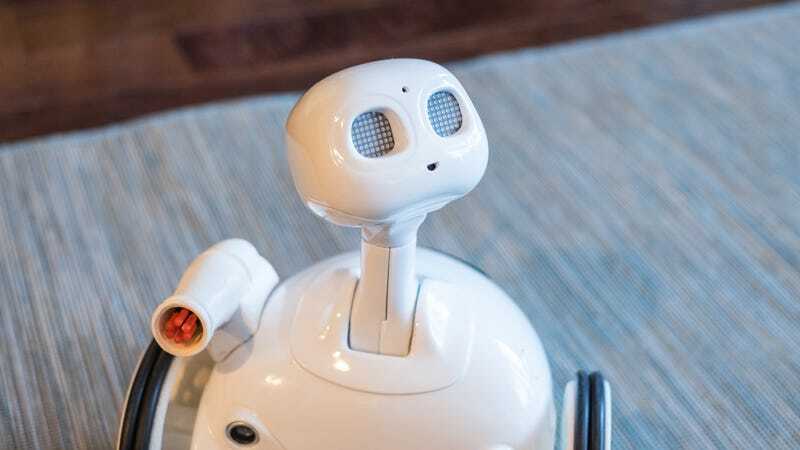 There’s one other thing worth thinking about before buying one for your kids: Robit is an internet-connected robot with wheels and eyes, and if there’s anything recent history has proven, it’s that basically everything gets hacked.